This is a dream of a recipe, not only because it’s an easy-to-prepare one-pot wonder, but because you can tailor it to suit yourself, like using chicken, pork or prawns instead of beef. This recipe will serve 4-6. Heat the oil in a medium pan set over a high heat and brown the meat all over for 2 to 3 minutes, stirring regularly. Add the garlic, ginger and curry paste and cook for 1 to 2 minutes more, stirring occasionally. Meanwhile, tip the rice into a sieve and rinse it really well under cold water. Add to the pan with the coconut milk, stock, raisins and some salt and pepper. Cover with a tight-fitting lid and bring to the boil, then turn it down to a very gentle simmer and leave to cook away for 10 to 12 minutes, until the rice is tender. Don’t be tempted to stir the rice during that time. Once the rice is tender, add the spinach and spring onions along with half the coriander, heating everything through for a minute or two until the spinach has wilted. If it looks too dry, add more stock or water. 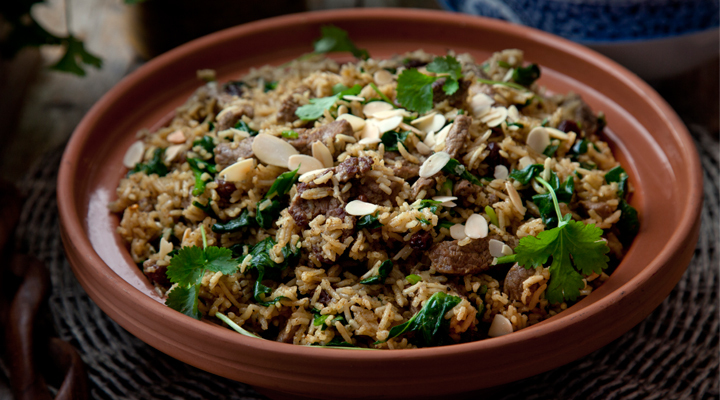 Serve with a scattering of the remaining coriander and the almonds over the top if liked. Amazing recipe. Really tasty, quick and simple. My 2 years old daughter absolutely loved it.